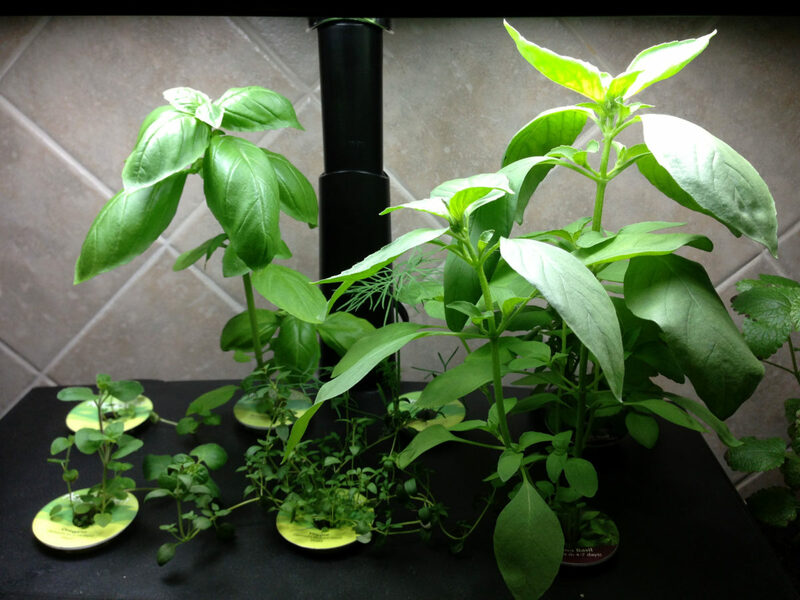 Over the year or so I’ve spent a good portion of my free time getting to know and understand Fresh Herbs. I’ve certainly come a long way….only to discover the journey has really just begun. I’ve decided to go ahead and share this post now, knowing it will be a post in-progress that I hope to add to as I make new discoveries. Before I was blessed with fresh herb porch gardens, I would on occasion (and still do) buy prepackaged herbs in the grocery store. Typically after finding an incredible sounding recipe built around 1 Tablespoon of fresh herbs. Then a week later I was throwing out the black mushy remains. The first solution that came to mind was to grow our own. As I’ve talked about in almost all Lemony Thyme posts (except maybe Adventures in Chocolate), cooking with fresh herbs will elevate your dishes. The ah ha moments will happen more frequently and dinner at home will begin to rival dinner at your favorite restaurant. Last year for Christmas (2011) I bought a trio of windowsill pots and planted sage, rosemary, and thyme. Unfortunately our windowsill wasn’t quite deep enough to accommodate so they were relocated beneath our under mount cabinet lights. They actually fared pretty well and became the inspiration for our Spring Thyme whiskey barrel porch gardens. In fact one of our sage and one of our rosemary plants are the Christmas originals. They will soon be moved indoors for the Winter. Update 4/29/13, we decided to leave all of our herbs outside for the Winter (we’re located in GA). I’m so pleased to say that all of our ‘hard’ herbs (thyme, rosemary, oregano, sage, and mint) are coming back with a vengeance. Flash forward to Christmas 2012, my mom-in-law gave us the coolest gift, an Aero-Garden, specifically designed to grow fresh herbs hydroponically. We planted seven different herb pods in March and six weeks later we’re harvesting like crazy. General rules of green thumb: whenever possible harvest herbs early in the morning after the dew has dried, use scissors to snip herbs, never cut more than 1/3 of the entire plant at a time. Basil – annual, easy to grow, needs to be planted when there is no chance of frost, plants want to go to seed – pick flowers as soon as spotted, harvest 1/3 of branch and cut just above a pair of adjacent leaves, remove leaves from stem. Chives – perennial, easy to grow, leave them alone and cut as needed, cut in small bunches about 1” above base. Cilantro – annual, difficult to grow, best to grow in phases, planting new every 3-4 weeks, and harvest at base of stems at least weekly from different areas of the plant, stems are edible. Good luck. Dill – annual, not on my favorite list, haven’t attempted to grow this yet. Marjoram – perennial, did not plant this year, but will next year. Mint – perennial, easy to grow, keep in a pot it will wander and take over a garden, harvest at will, remove leaves from stem. Oregano – perennial, easy to grow, also wants to wander, harvest at will, remove leaves from stem. Parsley – annual, easy to grow, harvest at the base of the stems, can remove leaves from stems – but the stems are edible. Rosemary – perennial, easy to grow, cut tops only or most of the stem, remove the needles from the stem, stems can be used as skewers to infuse rosemary flavor. Sage – perennial, easy to grow, harvest often to encourage regrowth, harvest 1/3 of branch and cut just above a pair of adjacent leaves, remove leaves from stems. Tarragon – perennial, easy to grow, harvest by removing 1/3 of branch, remove leaves from stems, discard yellow leaves. Thyme – perennial, easy to grow, harvest by cutting stem just above a cluster of leaves, remove leaves from stems. To become truly comfortable cooking with fresh herbs, it helped me to first learn a little about them and how to classify them if you will. I found a fantastic article by Beyond Salmon’s Helen Rennie where she separated herbs into two groups: Soft Herbs & Hard Herbs. Soft Herbs – cilantro, basil, parsley, mint, tarragon, dill, chervil, chives. Herbs you would eat raw or add to the very end of cooking, keeping the flavors fresh & bright. Add after removing from the heat to help prevent them from discoloring (turning black) and losing their flavor. Great used in sauces or dressings. Ideal for freezing, especially in butter or olive oil or as pesto (less the Parmesan cheese). Can also be dried. Hard Herbs – thyme, rosemary, oregano, sage. Herbs that are hearty stemmed where the leaves are removed before use, bolder strong scents. Can handle long cooking times, where their flavor infuses the dish. Add a pinch finely minced to the end of cooking as well. Can be used to infuse olive oil, but must be stored in the refrigerator and used within one week to avoid bacteria growth. Ideal for drying, but can also be frozen in butter or oil or in bunches in zip lock bags. As mentioned above, Soft Herbs like to be added late to a dish to keep their color and flavor fresh & bright. Hard Herbs can be added early to allow their flavors to infuse the dish. If a recipe calls for dried herbs, you can substitute and vise versa. 1 Tablespoon of Fresh Herbs = 1 teaspoon of Dried Herbs. Here is a basic list of herbs and some of the foods they love. Basil loves…Tomatoes, fruit, pesto, compound butters, Italian food, coconut, poultry, pasta. Cilantro loves…Salsas & salads, Asian & Mexican recipes, citrus & spice, avocados, curry. Dill loves…Dressings, vinaigrettes, mayonnaise, salads, fish, especially salmon, parsley & thyme. Marjoram loves…Vegetables, lemon, tomato sauces, chicken, pork. Mint loves…Mojitos, being paired with basil or cilantro, yogurt, chocolate, lamb. Oregano loves…Mexican, Mediterranean, & Italian recipes, lemon, garlic, oils & vinaigrettes, cumin, may be better dried. Parsley loves…Pesto, potatoes, eggs, mushrooms, onions. Rosemary loves…Breads, oils, meats, garlic, grilled recipes, sage. Sage loves…Butter, potatoes, pork, hearty seafood, fresh is quite different than dried. Tarragon loves…Vinegar, mustard, sauces, eggs, seafood, chicken. Thyme (English) loves…Mushrooms, meats, poultry, soups, stews, and sauces. Thyme (Lemony) loves…Everyone, vegetables, seafood, poultry, dressings, pasta. Once I understood their unique personalities I wanted to be sure they lasted as long as possible. Below are some tips on Storing Fresh Herbs. Once picked or purchased, lightly rinse herbs under water and gently shake to remove excess moisture. Trim ends, loosely wrap in paper towels then seal in zip lock bag and refrigerate. Parsley and Cilantro also are happy in a glass of water in the fridge. Trim ends and the bottom leaves and put in a glass of water with an inch or two of water. Loosely cover with a plastic bag. Basil can sit on your counter in a glass of water. Again, remove the bottom leaves so they are not in the water. If you don’t anticipate using your herbs before they wilt (typically within one week) you can always Freeze them in butter or olive oil in ice cube trays or Dry them by hanging them by their toes in a dark room or turn them into Pesto! You can also Preserve Fresh Herbs in Sea Salt and store them in an air-tight container for up to six month. What are you waiting for? Get your fresh herb gardens planted today! Do you grow chervil? If so, from seed? How does it fare? Hi Sarah, I have not grown chervil yet. We’re getting ready to put in lemon thyme, English thyme, sage, rosemary, oregano, and tarragon. Then in a couple weeks we’ll add basil, cilantro and chives. I have seen the Barefoot Contessa’s garden….agreed, amazing!! I don’t think you have to worry about this in the city….but where I am the deer eat EVERYTHING. So we had to move our raised garden from the back yard to the back deck. The whiskey barrels have been a great alternative. Thanks Cindy. As I said this post will definitely evolve as my fresh herb experiences are still very new. But I think I’m getting it :) Btw, my first batch of dried herbs have made it into jars and smell strong and beautiful!! I have attempted cilantro multiple times and at best it’s lasted a couple weeks. So it’s not you :) If you like fresh oregano I’d give it a try next spring. Ours was very happy, as was our thyme. They definitely all have their own personalities though. Does the oregano need a lot of sunlight? I have a terrace off of my living room that gets the afternoon sun. We get morning sun on our back deck until about 2:00, but my mom-in-law also does very well with it and has afternoon sun. She actually has several herbs in her porch garden that do well. I think the “hard” herbs may like the afternoon sun best. next year I’m going to try doing the oregano and maybe even the rosemary again. Do you ever watch Barefoot Contessa? Her herb garden is to die for!! OMG I would love to have a garden like that…LOL! !